The partnership will support the development of the professional expertise that is required to deliver critical disability services to children and adults with vision or hearing loss across Australia, and beyond. The new Macquarie Master of Disability Studies program, delivered by expert staff from RIDBC Renwick Centre, will offer three different specialisations ensuring that Australian teachers of the deaf, teachers of students with vision impairment and orientation and mobility instructors, are qualified at the highest level. The new program complements the Master of Special Education, Master of Accessible Communication and Graduate Diploma of Auslan-English Interpreting programs already offered by Macquarie. In the coming years, RIDBC will establish an extensive presence on the campus, relocating its offices, teaching spaces, demonstration schools and a range of services, in order to reach more people than ever before and to demonstrate excellent practice in the field of sensory disability. This will add to RIDBC’s existing presence at Macquarie’s Australian Hearing Hub, where it provides life-changing cochlear implant services, early intervention and therapy programs for children and adults with vision or hearing loss. Director of RIDBC Renwick Centre and Conjoint Professor in Educational Studies at Macquarie University, Greg Leigh, said co-locating with the university will open up new opportunities for cooperation in research and teaching. “RIDBC is Australia’s largest non-government provider of therapy, education and cochlear implant services for people with vision or hearing loss. We are thrilled to be able to bring together leading academics and researchers in sensory disability, to continue improving initial professional education and the quality of service delivery in this field. 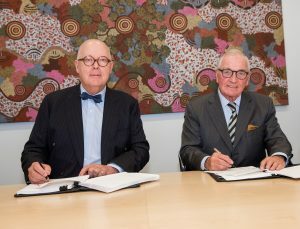 “This partnership with Macquarie will build on the success of our already strong collaboration at the Australian Hearing Hub,” said Professor Leigh. Professor Simon Handley, Executive Dean of the Faculty of Human Sciences, said the partnership is a chance to positively shape the future of inclusive and special education. “Partnering with RIDBC will provide unique opportunities for students from across all areas of human sciences to develop skills in the special education, accessible communication and hearing sciences. Royal Institute for Deaf and Blind Children (RIDBC) provides much-needed support services and education Australia-wide to children and families. This support enables children, from newborns through to their late teenage years, to overcome the many challenges associated with vision or hearing loss so that they can reach their full potential. RIDBC services are provided from twenty sites across Australia and through RIDBC Teleschool and telepractice. RIDBC Renwick Centre conducts world-leading research and offers postgraduate courses in a range of fields relating to the development and education of people with vision or hearing loss. For more information about RIDBC, visit www.ridbc.org.au.